Besides being among the biggest malls in the city, Cairo Festival City boasts a vast outdoor dining area with over 45 restaurants and cafés that cater to every taste. One of the latest additions to its long list of places is Fifth Street Coffee, which offers a varied selection of drinks, sandwiches and baked goods. Located next to Ila Café, the modern-looking venue is walled with gray tiles and furnished in simple wooden chairs and tables. Minutes after being seated in the outdoor area, we were given the simply-designed menu, which is made out of an HDF plaque with the pages strapped to it from top. 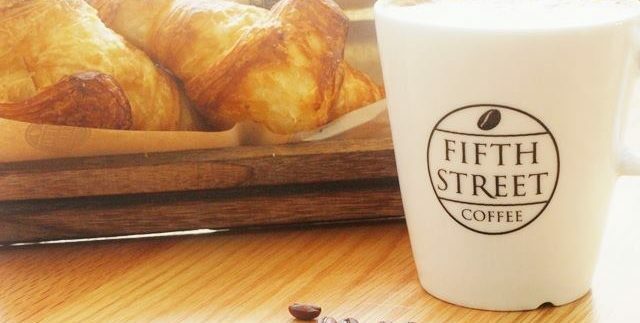 Along with the aforementioned items, Fifth Street Coffee has a number of breakfast options, from which we opted for the ‘French Style’ (39LE) and another called ‘The Real Thing’ (78LE). Consisting of a hot drink of your choice, croissant and a breadbasket with jam and butter, we highly recommend the French Style breakfast as an option for those who want to enjoy their coffee with a light snack to munch on. We enjoyed their cappuccino – which came in a satisfyingly tall mug – and an Emmental-cheese croissant, which was fresh, fluffy and plentiful in cheese. Served in a rectangular wooden basket with butter and Jam, the sliced multigrain bread was equally fresh, yet the scant portions of jam and butter hindered us from enjoying it to the full. Not as scarce, ‘The Real Thing’ breakfast has the same content of the first order, but with an Omelette and your choice of French toast or pancakes. The plain croissant was just as fresh as that the one with cheese, while the omelette – to which we added mushrooms and cheese – was all in all quite scrumptious; however, the generous amount of cheese hidden through the folded omelette had its drawbacks: it made the omelette greasy. It was an easy flaw to turn a blind eye to, but what we really couldn’t ignore was how bland the pancakes tasted. Despite being topped and layered with Nutella, it didn’t taste as promising as it looked. But apart from these little flaws, we still believe that Fifth Street Coffee has enough to make regulars out of us, thanks to the friendly and efficient service, the fresh baked goods and the coffee. You can order from Fifth Street Coffee while you’re sitting in Ila and vice versa. The baked items were noticeably fresh. The pancakes were disappointing, especially considering how good everything else was.